I don’t know if I should call this the genealogy project anymore. A better moniker might be Who were my grandmothers? Something new that generally contradicts the stories I’ve been told pops up with each of them. 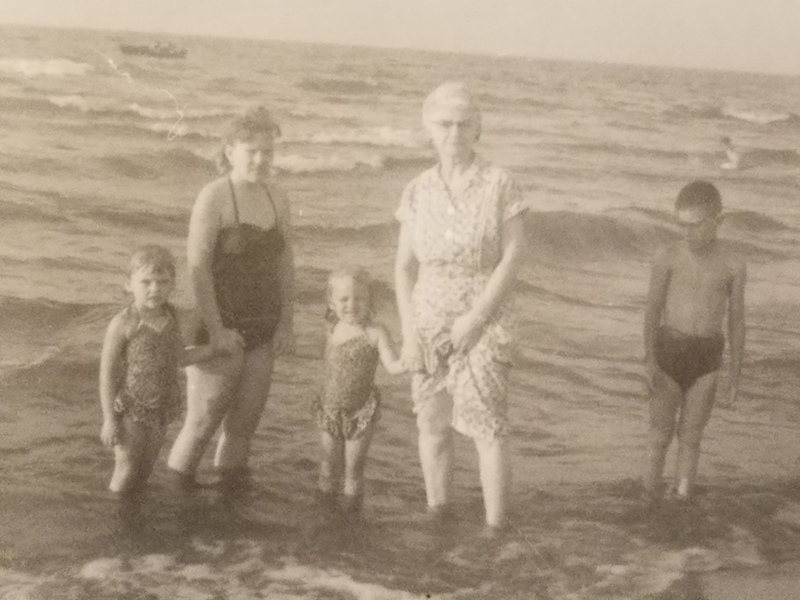 I started life with 5 grandmothers: Mom’s grandma, called Little Grandma; Dad’s maternal grandmother, called Gainsey; Dad’s paternal grandmother, Grandmother Mayne; Mom’s mother, Grandma Eaton; and Dad’s mother, who my brother named Plain Grandmother, P.G. for short. Then there’s the pictures. I have a plethora of photographs that go back to the civil war and possibly before. This picture of Grandmother was my first clue that she was not a concert pianist. 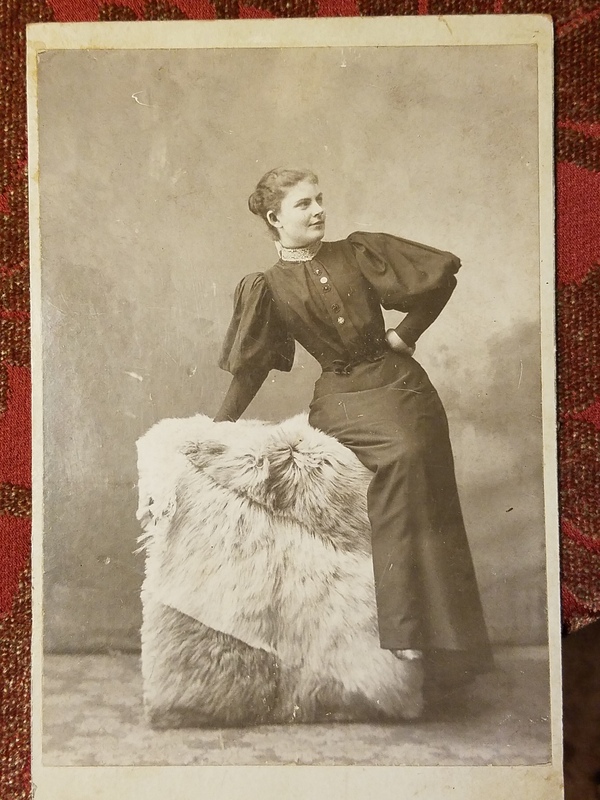 A girlfriend whose family had owned a photography shop over in Illinois pointed out to me that this was a “performer pose”. My great-aunt Bernie provided another clue when she gave me this little flyer. The year 1900 written on there is my grandmother’s handwriting (I can tell because she wrote me letters). If you could look closely, you’ll see that this is not a concert pianist performance. I’m more impressed that she had star billing and ran the show! She sings, plays mandolin and piano and it’s all “pop” music of the day..! Probably there was some dancing. 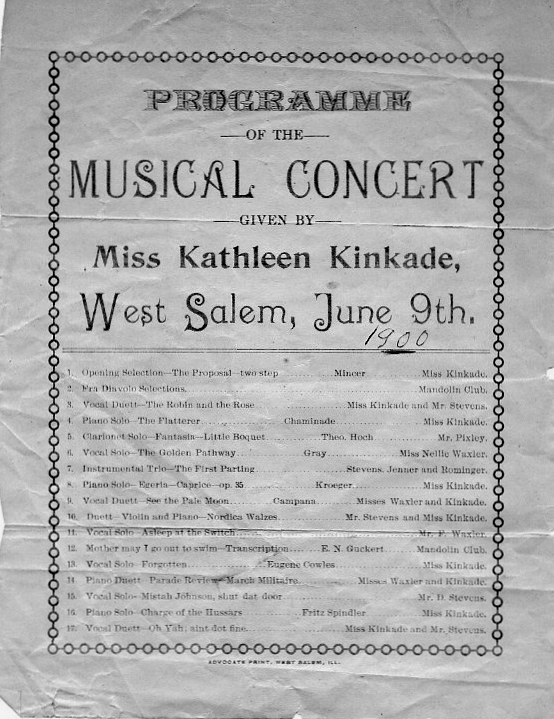 Add that my great-grandmother was born Olive R. Kinkade and “changed” her name to Kathleen, and it doesn’t seem to me that she was a prim, college-educated concert pianist. So, back to the train. Ben L., the handsome county clerk, was also a teacher in the Browns School District, living with his mother and sister in Albion. He took his bride home and that’s where my grandfather was born 9 months later and where my great-aunt Bernie was born 14 months after that. According to Aunt Bernie, grandmother insisted on “having her own home” when Bernie was 2 or 3. This picture was taken in front of that house. No doubt Grandmother had to re-invent herself again when she married into the Mayne Family. They were rather snobbish and would not have approved of her background. As a result, I rarely heard much about her childhood and only knew for sure that her mother had died when she was 6 months old, she had an older sister named Anna, and that her step-mother had not been kind. Bernie said that the Kinkades were “poor”. It is hard to tell what is “poor” and what’s not, but I’ve discovered just who they were, and who my grandmother’s mother’s family (McWilliams) were and that tells a story much different than what I expected. Having spent the week being JoJo the grandma, it is easy for me to imagine how much my grandmothers enjoyed being around me and my siblings. Double that to a great-grandmother and it must be twice as joyful, especially if you are able to play with them and teach them. 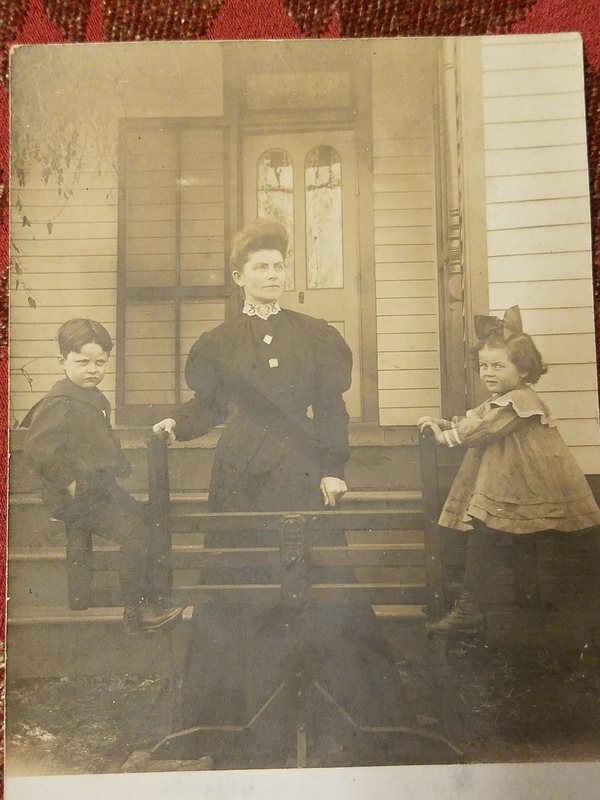 I learned so much from my great-grandmother Mayne, more than from any other grandmother. She taught me to love poetry and playing piano, and she had large closets full of books to read. She tried to teach me to embroider and crochet. We helped her bake pies, rolling out the dough and slinging around the flour, and she would save a little bit of the piecrust and bake it just for me. She put butter on her crunchy peanut-butter sandwiches and used Roman Meal bread. We played Chinese checkers and she didn’t let me win. She wrote us letters and had Thanksgiving at her house, Christmas at ours. I spent a couple of weeks each summer at her house getting spoiled and doted on.